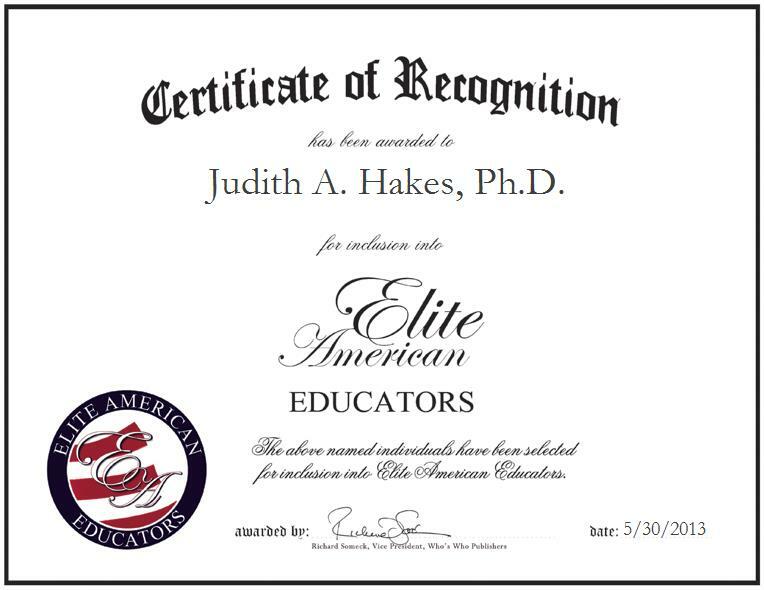 SAN ANGELO, TX, May 30, 2013, Judith A. Hakes, Ph.D., Professor of Education at Angelo State University, has been recognized by Elite American Educators for dedication, achievements, and leadership in education. Specializing in the area of elementary education, Dr. Hakes strives for excellence in her endeavors to teach graduate and undergraduate reading methods, social studies methods, language arts and multicultural classes at a well-known institute of higher learning. She possesses more than 42 years of professional experience, and she continues to nurture a growing skill set. She was inspired to pursue her current career path by a desire to make the most of the knowledge and experience she had acquired over the years. Dr. Hakes has worked with Native American students for many years. She is also a recognized master woodcarver. She feels that she has been able to thrive professionally due to sheer hard work and a genuine and innate passion for the work she does. She remains abreast of trends and developments in the field of academia as a member of the National Council for the Social Studies, Kappa Delta Pi, and the International Reading Association. Contact Judith A. Hakes, Ph.D.